January’s box from Simply Earth has been my favorite so far! If you haven’t seen my first Simply Earth essential oils box review, be sure to check it out. Their boxes are a unique mix of essential oils and fun crafts! 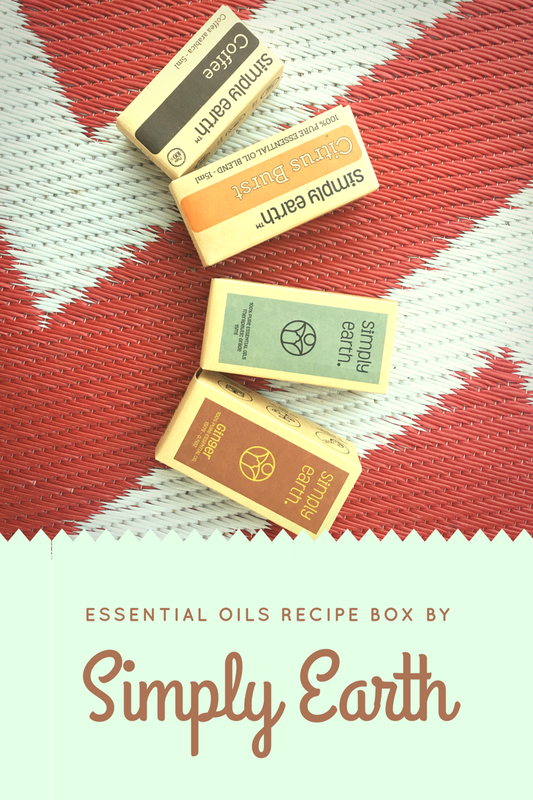 Each box contains 4-5 full size, high quality essential oils, 5-7 recipes for using them (on cute little notecards), and most of the supplies you’ll need for each project. Boxes start at only $39 per month. January’s box was all about creating homemade beauty products with essential oils. On several occasions I’ve seen posts on Facebook or heard other moms *cough* my sister-in-law *cough* talking about making things like homemade lip balm and facial products and thought, “Who on earth has that kind of time?! I’d love to do that, but really?” I mean, I was totally confused as to where these women were finding these extra hours in their day. I’m currently sitting at my computer, in the dark, and running back and forth from my kids’ rooms, trying to get everyone to actually go to sleep. On most days, I’m in a dead run from the time I wake up until 9 pm or later. Well, thanks to Simply Earth’s essential oils recipe box, I realized I was wrong! It’s really simple and not nearly as time consuming as I had imagined. I spent less time making 6 tubes of lip balm than I do trying to decide which one to purchase when I’m standing in the store staring at them. It was truly a 1, 2, 3 & done process. 1. Melt beeswax & almond oil in a double boiler. My little girls love lip balm. They call it their “lipstick,” and want to wear it every time they see me putting on make up. Now I can hand them their own tube of homemade lip balm, knowing it’s free of dyes, natural scents my youngest daughter may be allergic too, or any other unnecessary chemicals. And look how pretty they are. This month’s subscription box also included two diffuser blend recipes. I enjoyed them both, and a friend suggested using their “Rejuvination Blend”(lime & cedarwood) as a mom-hack for those days that you don’t get to the cleaning. Ha! She’s such a genius. Why didn’t I think of that? My second favorite project in this box was making the Beauty Within Face Mask. I don’t tend to have dry skin on my face, but it will be an amazing hand cream for this mama that washes dishes and/or her hands 100 times each day! Again, I was surprised by how super easy it was to make too. It was basically the same process as the lip balm. This essential oils box also included a recipe for a Beauty Within roll-on and a solid perfume (along with the supplies for each of course). There’s a fun video of the roll-on over on my page on Facebook. If you want to try it out for yourself, you can see their subscription box options and individual products over at www.simplyearth.com.